The surprise announcement of unification of the main left parties (UML, Maoists and New Force) and the subsequent creation of a counter ‘democratic alliance’ of the NC, Madhes-based parties and RPPs signals the making of a two-party state in Nepal. Although some are arguing that two strong political blocs could usher in long-awaited stability in a country mired in an endless transition, others are not so sure, noting that the main political actors have not changed: they are still mostly conservative, ‘higher’ caste men. 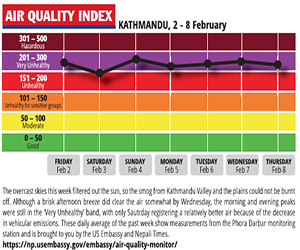 Regardless, this week’s tectonic shift in Nepali politics is certainly a defining moment: it will either put the country on the path to prosperity, or push it into another cycle of instability. The outcome will largely depend on the results of federal-parliamentary polls in November, and how the parties react to their electoral performances. 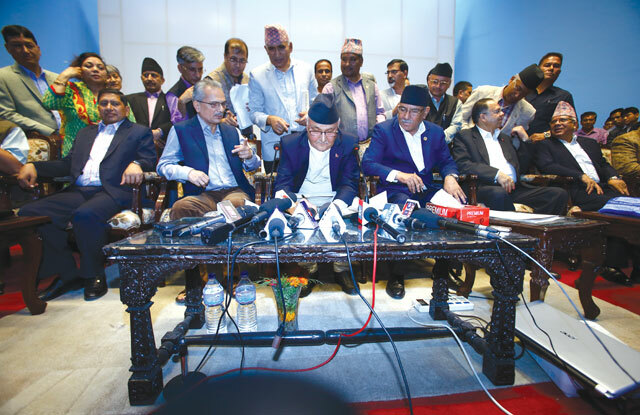 OPPOSING ALLIANCES: After the UML and Maoist Centre signed an electoral alliance pact on Tuesday the Nepali Congress did the same the next day with Madhes-based parties and the RPPs (below). 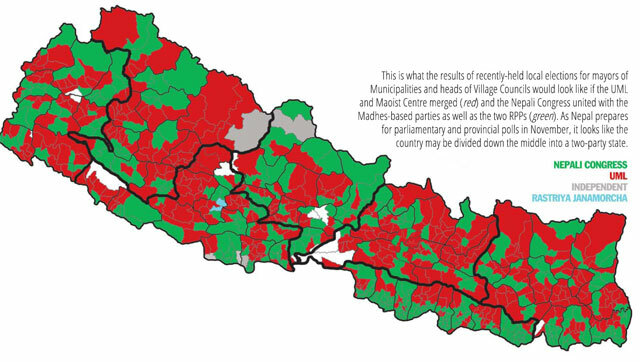 As things stand now, and based on results for the UML and Maoists in the second CA elections in 2013 and this year’s local polls, the unified left may win a majority, and rule the country for the next five years – a political feat never before achieved in Nepal’s democracy. 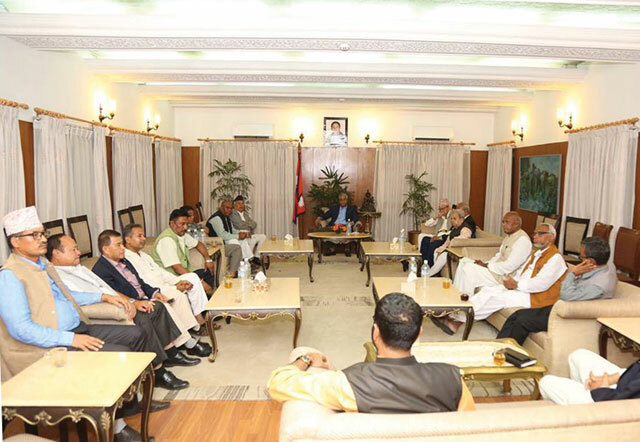 The UML, Maoists and New Force (top photo) also agreed to unite after the polls and rebrand as the Nepal Communist Party. But if the poll results do not meet their expectations, cracks will appear, and they may split once again. The so-called democratic alliance looks weaker now, but it has an incumbent advantage for November. Whichever alliance wins, there will no longer be an opportunity for a third king-maker party to oscillate between the two poles, toppling the government every nine months like the Maoists are doing now. Economist Biswo Poudel is hopeful there will be political stability, a prerequisite for economic growth, under this two-party state. But he warns stability alone would mean nothing without investment in human capital and institutions. Poudel argues that stability existed even during the Rana oligarchy and Panchayat, but that it did not actually translate into Nepal’s development. “Political stability is necessary but not sufficient for growth,” he told Nepali Times. Nepal’s Communist history is replete with splits, and the UML and Maoists have deep ideological differences. Besides, dividing up election tickets and creating space for the leaders of the two largest communist parties will only be the first of many challenges for a unified left.